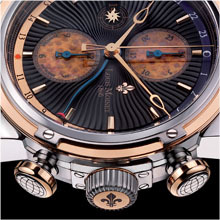 “GEOGRAPH rainforest” associates the unique Louis Moinet legacy with an exceptional new material: petrified palm wood. Each watch sold will enable a substantial contribution to the “PULAU BANDING Foundation”, which aims to preserve the Malaysian tropical forest of Belum-Temengor, one of the oldest in the world. Through its rich heritage, Louis Moinet expresses a unique brand identity: the time is indicated by “Gouttes de Rosée” (dewdrop) hands, on a dial adorned with “Côtes du Jura”®. The dual-time display is read off by a serpentine hand that makes a perfect match with the sinuous “Côtes du Jura” ® motif. Read-off is facilitated by the “24-hour” ring composed of two separate elements featuring a perfect finish ensuring an extremely high-end aesthetic effect. These “24-hour” rings are made to extremely precise tolerances, and only the finest watchmaking artisans are deemed competent to produce them. The design of the minute circle, of the “moon” and the “sun” are inspired by original Louis Moinet creations dating from the 1820, and in particular the “return from Egypt” clock made for Marshal Joachim Murat, as well as the “Egyptian discovery” clock. 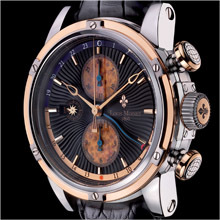 The self-winding mechanical movement with its 8 vibrations per second (meaning 28,800 vibrations per hour) drives a variety of indications including the hours, minutes and seconds; the 60-second chronograph function with 30-minute and 12-hour counters; as well as a dual-time display adjustable via the crown. “GEOGRAPH rainforest” is a unique creation issued in a 120-piece limited edition dedicated to the wrists of modern-day adventurers. Tropical forests are home to two-thirds of the world’s living animals and plants, and their preservation is essential to the future of our planet. The “Pulau Banding Foundation” is located at the far end of the tropical forest of Belum-Temengor, mid-way between the east and west coasts of Malaysia, near Gerik, in the state of Perak (Malaysia). This is one of the world’s oldest tropical forests. It is believed to be 130 million years old and is spread across 300,000 hectares accommodating a wide variety of animals and plants, including many that are unique in the world. The “Pulau Banding Foundation” aims to promote the sustainable development of the tropical forest ecosystem of Belum-Temengor, as well as the study of this area. This forest is of capital importance, since it hosts over 3,000 different plant and flower species, including three varieties of Rafflesia, the world’s largest known flower. It is also the natural habitat of 64 species of fern, 62 species of moss, 10 species of hornbills and its lake has 23 varieties of freshwater fish and five species of turtle. The surface area of the Belum-Temengor tropical forest corresponds to four times that of Singapore. It is a favourite place for large jungle animals such as tigers, elephants and rhinoceros. Among them are 14 mammal species threatened with extinction: the Malayan tiger, the Malayan bear, the Sumatran rhinoceros, the white-handed gibbon, the Asian elephant and the Malayan tapir.